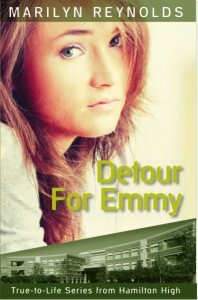 Teaching guide available for Detour for Emmy! In the 9th grade, Emmy is an A student, a soccer star, and a lead soprano in the school choir. She falls for a junior who is also one of the choir's lead singers. Art is a dream of a boyfriend until Emmy finds that she's pregnant. His response is immediate denial and abandonment. Emmy's mother is angry and pushing for an abortion. Her guidance counselor claims that Emmy's life will be ruined by this turn of events, and only one of her friends tries to stand by her. Emmy must discard her plans and dreams of going away to college on a scholarship and find new plans and dreams that include life as a single mom. Directly from New Wind, Barnes and Noble, Amazon, or from your local independent bookstore. Detour for Emmy is the best book in the whole world!!!! It’s a story about a girl who falls in love with "the boy of her dreams" in high school. The author’s style is quite interesting since it’s a girl’s perspective and it was a great experience reading her work. I love the fact that the author writes a bunch of stories about teens. Since it’s about teens it was easy for me to read it since I’m a teenager myself and it’s interesting because I would want to be able to click as well in high school when I talk to girls. I would recommend this book to whoever likes high school drama, boy/girl relationships, and family drama. — Damon L.
This book hit home hit home with me. I recommend this book for any teenage parent to read. It is well written and is not full of fluff. It says what can happen in such a situation and the reality of what it is like to raise a baby as a teenager. It doesn't beat around the bush it says it how it is and that is all that matters. Teenagers need to know the reality of such a situation and this book shares with them that reality. — Marie Z.